In the end we hear the nightmare-inducing sounds of man’s throat being slit open, halaal style. Nothing prepares us for the cold blooded brutality of Hansal Mehta’s chilling chronicle of Ahmed Omar Saeed Sheikh, the British-Pakistani terrorist who planned and executed the murder of Daniel Pearl. 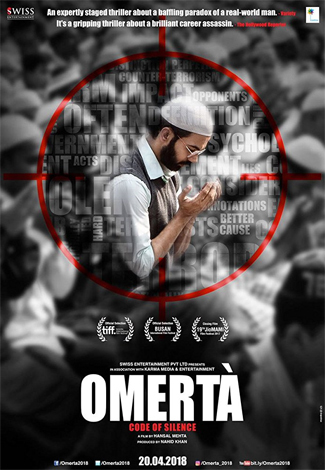 Omerta is not an easy film to watch. The violence that grips the heart of the protagonist seems to clamp itself around the narrative creeping up on the plot points ladling the terror-ridden violence with a staggering inevitability. The film is shot like a sweeping arching documentary, creating a screen secreting slivers of silent screams. Terror and terrorism have afflicted our cinema in ways that are both life-changing and long-lasting. Omerta takes both the routes and comes up with some dead ends in the narrative, much like what often occurs in violent lives where the only certainty is sudden and brutal death. Ironically Omar Sheikh lives at the end, in spite of all the unimaginable violence that he perpetrates. And perpetrates with such conviction. The film has many loose ends, threads from the theme of violence hanging around uneasily, suspended in midair as globules of gore collide and split apart our sense wrong and right. At the centre of this skewed universe of tantalizing thought-processes and damning aggression is Rajkummar Rao playing Omar Sheikh, the kingpin terrorist so sure of what he thinks is wrong with the world that he makes us, the pacifists, question our belief in nonviolence. Rao’s is a deeply disturbing performance. It is cool and persuasive. Brutal and unscrupulous, his portrayal of Omar tears into the innards of the anatomy of terrorism and comes up with very disturbing truths. In the sequences with his father in London, Omar comes across as shy and inhibited. This is a man who sees humanism in barbarism and salvation in terror. Some of the on-screen violence is unbearably brutal. And I wonder what the censor board would make of it.